This executive 4 bedroom, 3 bathroom villa with screened pool and jacuzzi is 15 minutes from Disney, beautiful wetland and nature surroundings, on site activities, tennis, volley ball courts, communal pool, BBQ and children's play area. The Bridgewater development is convenient yet secluded-Orlando international airport is 45 minutes away, Sanford 1hr. Bridgewater is a 78 acre community nestled among 165 acres of natural wetland, nature preserve, a 45 acre deep water lake and lake front nature trail together with a communal pool and tennis courts.... yet within 15 minutes of all major attractions, Magic Kingdom and Epcot are all within easy reach of Interstate 4. Fantastic late deal!!!!!!!!!! : Special offer.10% Discount on bookings of 3 weeks or more. A daily maid service can be arranged, a welcome food hamper can be arranged, cots and high chairs can be hired, the pool can be heated during the cooler period at £100.00 per week. Our agents are at hand, they have an office on site. The master bedroom has a king size bed and TV/cable, bedroom 3 has a queen size bed. One of the twin bedrooms is decorated with a Disney theme and has a TV/VCR. There is also a communal area if one so desires with,a children's play area, a pool and changing area, sun loungers, tennis courts, volley ball and BBQ area. There are large lakes for fishing. The villa is fitted with a burglar alarm for added security. The front porch has 2 white rocking chairs for relaxation. home is in needof new bedding. only master suite had decent mattress. furniture very old and uncomfortable. the pool area showed a hot tub, but it do's not work. the management team was exceptional. our only saving grace. I'm sorry you here that you felt that way , But in 17 years we have never had bad feed back unfortunately we are able to please everyone. I have spoken to the agents in depth they have informed me that your comments are completely unfounded. The spa was working with or with out pool heat maybe you were not following the operating instructions properly and the agents have informed me that no calls were made. You were fully aware of the Style of furnishings at the house from the 360 degree video. You rented a four bedroom 3 bathroom villa with pool and Spa sleeping 8 people on a quiet nature reserve for less than the price of a Motel Room on Highway 192. Villa was fabulous very well kept equipped and clean great pool area with nice sitting area. Location was very wonderful short drive to all the attraction but villa community was very nice and peaceful. Owners were wonderful to work with. Office staff was great also answering any question we had and tips on were to eat and things to do. Would rent again. A good winter get away! We rented this villa for the month of February & had a good stay. 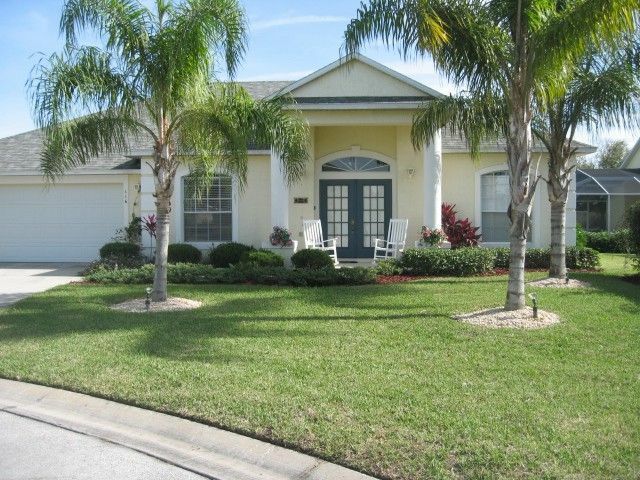 This property was located in a convenient area to Orlando, the airport & the many attractions Florida has to offer. The subdivision was nice & quiet & the villa was quite comfortable. Our grandchildren enjoyed the pool, the "Disney themed" bedroom & the toys. The property manager was extremely helpful & prompt to our needs & questions & assisted us with some minor housekeeping issues. The house served us well & we hope to return to Florida again. Maybe next time it will be warmer as the weather was cooler than we would have liked. Thank you Barry & Anita for sharing your villa. Anita and Barry confirmed our details and sent through the Villa information. Upon arrival everything was as expected. The villa was lovely. Very clean throughout. The super-kingsize bed was incredibly comfortable we often slept in! Free wifi is included (but not mentioned) Worked well. Very handy for staying in touch with family back at home. Just around the corner (in an Amreican size kind of way) is Publix Supermarket, Chillis restaurant plus other shops and petrol stations, all within the very nice golf complex. Very close to Disney (2 junctions) great for popping back for a rest before returning for the quieter night time periods at Disney. Pool was warm (although we did have pool heating included). All in all just what we needed and we didn't want to come home! The owners Anita and Barry were excellent in there communication and booking routine. They provided great information and were very helpful in taking care of us. The villa is of a good size (we had six in our party, but would accomodate 8) and all the facilities within the villa are in good order. The villa is presented very well and the owners have obviously taken great care in looking after their holiday home over the years. The location in relation to Disney Universal and other parks is very good. 25 minutes to Universal and about 20 mins to Disney. While we were there the we had to contact the management company for a few minor things. They were easily contactable which is a great plus, but feel that they let the owners down a little by not dealing with a few maintenance issues quickly enough. All in all we had a great time in Florida and were comfortable in the villa. Thank you Barry and Anita. Champions gate golf club close by. Golf: The new Champions Gate Golf Course is 3 minutes away. Also there are a number of courses in the area.